Easy, healthy and delicious Zen Bliss Balls made from coconut and sunflower seeds. The perfect gluten-free and vegan energy boosting snack! preparation & their healthy deliverance of coconut & sunflower seed flavors. If you do not have a food processor or blender, you can grind the sunflower seeds as smoothly as you can with a mortar and pestle or you can use this sunflower ‘sun’ butter and then hand mix all of the ingredients until as smooth as possible. For a keto or sugar-free version, you can omit the maple syrup altogether or use a low-carb sugar-free sweetener such as this monk fruit syrup for a still-tasty treat. Due to the unique nature of coconut flour, I do not recommend replacing it with anything else. You can replace the chia seeds with soaked flax seeds instead if you prefer. 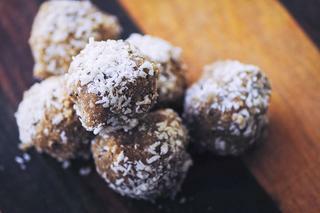 These energy balls taste great with cinnamon instead of nutmeg if you would prefer. You can use shredded instead of flaked coconut for similar results. You can use pumpkin seeds instead of sunflower seeds for another nut-free alternative. Blend all ingredients in a food processor or blender until a smooth dough forms.Shape into balls.Roll in shredded coconut.Store in freezer until ready to eat.Enjoy!